The arts and history go hand-in-hand in Eastman-Dodge County, Georgia. 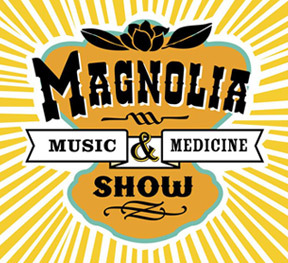 Your experience here isn’t complete without seeing the Magnolia Music and Medicine Show at Eastman’s Magnolia Theater. And to satisfy all your yearnings for a peek into the past, pick up a brochure at the Chamber of Commerce for the Eastman Driving Tour. From trains to planes, Eastman’s history will move you. Delve into our past, including the original Stuckey’s store which earned Eastman the title “Candy Capital of the South,” the old Chauncey School that was erected in 1914 on a budget of $10,000, the 1897 jailhouse complete with hanging gallows, Victorian homes, railroad tradition, and so much more. One of Dodge County's most beautiful historical landmarks, the 1887 Orphans Cemetery features brick-columned entrances, paved streets, running water and immaculately landscaped grounds. Saddened by the death of a neighbor's young son, Albert G. Williamson donated a burial plot, then later donated one acre (the family later donated three additional acres). Home to the Williamson Mausoleum, Orphans Cemetery is listed on the National Register of Historic Places. Off Hwy 23 N on Orphan Cemetery Road. A production of the Dodge Arts Guild of Eastman, Georgia, this family-friendly show styled after an old-time radio broadcast based around a traveling medicine show features guest artists, local talent, comedy, and a big dose of fun. Presented six times a year at the Magnolia Theater, 122 Main St., Eastman, GA 31023. Featuring bricks inscribed with veterans' names, as well as a lighted flag and markers honoring each branch of the U.S. Armed Forces, the memorial serves as a towering symbol of their generous sacrifice. Commemorative speeches and poems line the walkway to the Veterans Memorial, and park benches offer a spot for reflection. Just off the Hwy. 341 bypass in Eastman, Georgia. 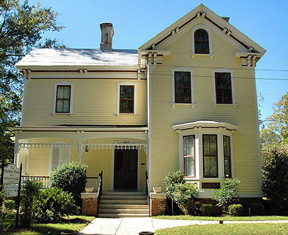 Mister Angel, the first English bulldog mascot to the University of Georgia, is buried near this spot at 130 Oak St., Eastman, Georgia. 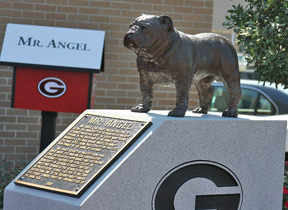 Mister Angel served UGA as mascot from 1944 until his young mistress, Marie Coleman Wilson, graduated in 1946. His appearance and captivating personality inspired the athletes of UGA to insist English bulldogs remain as the school's representative. Today, the breed has become one of the nation's most famous collegiate symbols. The impressive Williamson Mausoleum was carved from marble by an Italian sculptor from a picture sent to him in Italy. 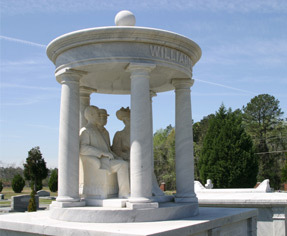 The three life-size figures are Mr. & Mrs. A.G. Williamson and his nephew, Jay Gould Williamson. In the Orphans Cemetery. In 1937, W.S. Stuckey opened his first roadside stand in Eastman, Georgia to sell pecans to tourists. In 1948, Stuckey constructed the first Stuckey's candy plant in Eastman. A historical marker stands at the spot – 100 Candy Court, Eastman, Georgia – where the original Stuckey's road stand and factory sold and produced the Stuckey's legendary pecan logs and other candy. 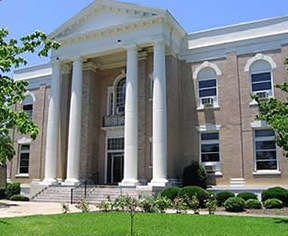 Chauncey was the first city in Georgia to issue bonds to construct and equip a modern school building. 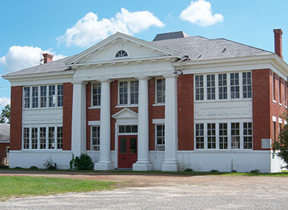 As a result, the Chauncey School was built in 1914 on a budget of $10,000. The building featured six classrooms, a state-of-the-art science laboratory, and a regal auditorium. The interior of the building contains numerous details common to early twentieth century architecture, such as pressed tin ceilings, elaborate moldings and glass doorknobs. The school, which now houses the Chauncey Municipal Center, is undergoing renovations to restore its original splendor. tree to which Jefferson tied his horse. The second is near the historic Parkerson Church, off present-day Hwy. 341 and Friendship Baptist Road. This route led the group through present-day Rhine, Georgia and then onto the Ocmulgee River. The Parkerson Church, built as a log house in June 1831 by Jacob Parkerson, is one of the oldest churches in Dodge County. 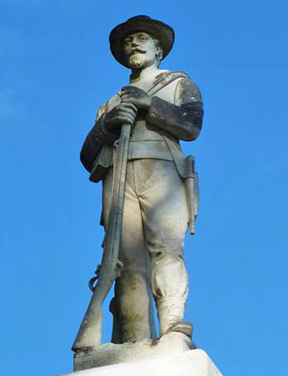 The Fanny Gordon Chapter of the United Daughters of the Confederacy erected the Confederate Monument in April 1910 in celebration of local soldiers. On Courthouse Circle, adjacent to the Dodge County Courthouse and the Old Jailhouse.